Nobody likes a quitter, right? As the old adage says, quitters never win. But what about quitting while you’re ahead? Is there ever a time when quitting is a better decision than sticking something out? As the end of the school year approaches, my girls tend to experience what I call year-end burnout. Last year, around this time, both of my girls were Girl Scouts and were begging me to quit. The year before, my oldest was taking swim class and had enough. The year before that it was horse riding lessons. I didn’t let them quit. I told them that these are all things they wanted to try, and because they asked to be a part of something, they needed to finish it. I made sure that they were aware that they didn’t have to continue once the season or class was over, but they did have to finish what they started. More recently, my oldest has been complaining about the book club that she is in. The club meets twice a month, and she has to read two books a month. It doesn’t sound like much, but when you add in school work and the theatre class that she is taking, her schedule can be a bit overwhelming. However, I don’t know if quitting is the answer, especially since there is only about three months left. But the issue is that she is being much more persistent about quitting than ever before. She literally hates the book club and is falling behind in the club’s reading assignments. And although I think that the year-end burnout is partly to blame, I can tell that she is done and most likely isn’t going to add anything of value to the club. So, here is my dilemma. I’ve never allowed my girls to quit anything before. And I have given them the “you’ll be letting your team down if you quit” lecture. But another truth is-isn’t it okay to quit something that is making you miserable? How do I tell my children to strive for happiness, but then tell them that they can’t quit doing something that makes them unhappy? Not to mention, people quit jobs, relationships, hobbies to pursue other things that can make them happier. I don’t think I know one person who hasn’t quit something (or given up on something or someone) in their lifespan. 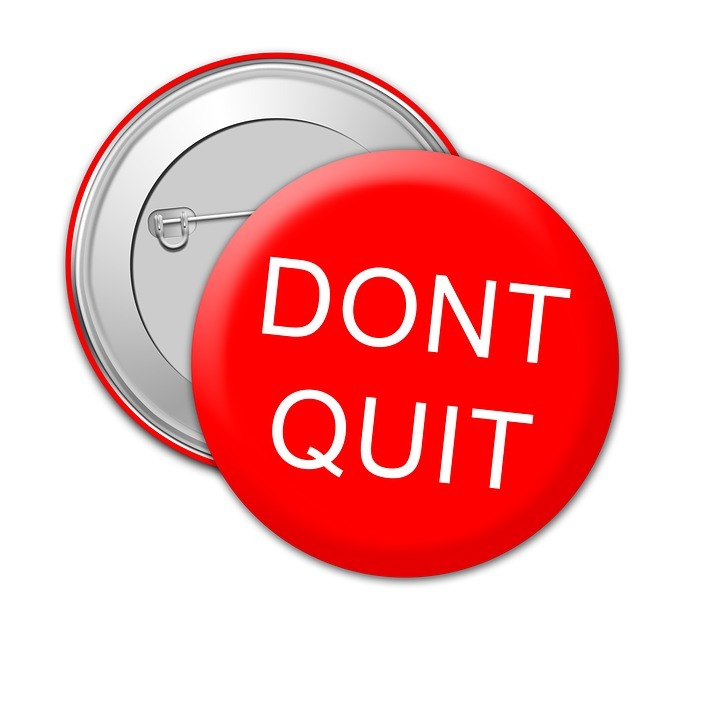 Even though it is always associated with a negative result, quitting is actually a part of life. And maybe if you are someone who quits everything all of the time, I can see how it could be a terrible thing. However, my children are young (seven and ten years old), and they are still trying things out. They are going to be “finding themselves” well into their twenties. Quitting might not always be the best choice, and may not result in happiness. Quitting may teach them the lessons related to actions and consequences. But it also might move them onto things they may never have started had they not quit. I know it sounds like I am being an advocate for quitting. And I assure you that I am not. It’s just that this is the first time I have ever sat down and really thought about it. I don’t think quitting should be the “go-to” solution for problems. It really should be the last resort. But I also don’t think that it deserves the negative connotation and shame that comes along with giving up on something. From personal experience, I know that there are some benefits to letting something go. As I end this blog post, I am still unsure about what I am going to do with the book club decision for my daughter. I hate how sad and stressed this is making her. And because she isn’t part of a team, this really is more of a personal decision, which is making me lean towards letting her quit. I have also thought about letting her quit, but then giving her a strong warning about being sure about something before committing to it. But that opens up a whole different can of worms. If I tell her that she has to be more calculated about committing to something, will that lead to commitment issues in her future? You can see where this is going. Because they are still young, my decisions are their decisions and choosing the right path while teaching them a life lesson is not always easy. And the thing I keep thinking about is that I am agonizing over this small thing-a book club. As they grow older, the subject matter will only get more complicated and harder to navigate with just pure logic and a dash of hope that they will make good choices. So, the question in this case is-when it comes to your children, if you can’t have both, what is more important-the lessons or their happiness? This piece was published on Mamalode on April 2, 2015.